Pat Barker came to prominence in the 1990s with her trilogy of novels set in the First World War (Regeneration, The Eye in the Door, The Ghost Road), the third of which took out the Booker Prize. 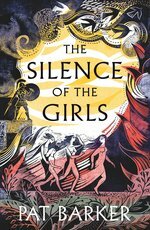 In The Silence of the Girls she goes much further back in time, to the Trojan Wars. This story, told in The Iliad, has been reinterpreted and retold many times. Barker takes a new tack, telling the story not from the perspective of the soldiers but the women who were their chattels and their prizes and their slaves. The Iliad opens with an argument between Achilles and Agamemnon over a woman. That woman is Briseis, a prize of war claimed by Achilles earlier in the campaign. Barker opens her book earlier in time, with Briseis watching as Achilles and his troops sack her city and kill her family. She and the other women are taken back to the Greek camp and distributed as prizes. Briseis, the biggest prize, is ‘awarded’ to Achilles. By the time I was eighteen I was the veteran of many long and bitter campaigns. Mynes seemed unaware of the tension, but then in my experience men are curiously blind to the aggression of women. They’re the warriors, with their helmets and armour, their swords and spears, and they don’t seem to see out battles – or prefer not to. I was useful, I suppose; I served a particular purpose. Men carve meaning in women’s faces; messages addressed to other men. Barker invests life and insight into Briseis. She is a woman who understands the world around her and struggles to live in it. At the start of the book she declines to commit suicide when her city is sacked and this, in the end, is the story of how she learns to survive in a world that is antithetical to her having any real agency. Many retellings of the Trojan wars ignore the role and influence of the gods in the original story. Barker does not take this route, instead treading a fine line that often only hints at supernatural intervention. Some events are ambiguous – so that the spread of bubonic plague may well be the judgement of an angry Apollo or just a result of poor hygiene. But others, including how Achilles is given his new armour by his sea-goddess mother, or the way in which Hector’s dead body does not decay, seem to be more sided towards some form of divine intervention. In these ways Barker sticks closely to the original story. In scenes reminiscent of her World War One novels she wades into the battle but also spends time (with Briseis) in the hospital tents, tending to the wounded. This world is brutal and unforgiving. Yet despite the number of young men dying in the battle it is the women who bear the brunt, usually in silence. So that the sacrifice of Hecuba’s daughter as an offering that seals the end of the war, while gut wrenching, comes as no surprise to the reader. Using the skeleton of The Iliad as a scaffold, allows Barker to go behind that story and give untold perspectives of the action and its aftermath and in doing so dig deeply into her themes. This is a powerful novel and a timely one.